EU officials, parliamentarians, high level wind industry professionals, as well as many representatives of renewable energies in Europe lent a buzz to the EU quarter last week at the EWEA summer reception. Europe’s energy movers and shakers congregated at 80 rue d’Arlon to discuss the continent’s energy future over a cocktail, fine cuisine and lively music. 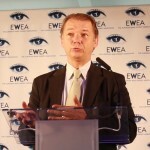 Philippe Lamberts MEP, the newly elected co-chairman of the Greens group in the European Parliament, opened the event with a moving speech on Europe’s future. Many Europeans see changing energy has something that we’ll tackle once the economic crisis is over, but an energy revolution now is necessary for the climate and a necessary strategy for energy independence, he stated. Lamberts said that today we are part of a continent that is looking backwards and not forwards towards finding the solutions that will lead to a sustainable future. The economic crisis has increased distrust; Europe is a continent that is “afraid of itself,” he said, adding that the ambitious climate and energy package agreed by EU leaders in 2007 would not have got a majority in today’s European Council and Parliament. We must recognise that “every cent we put in yesterday’s industry we cannot put towards tomorrow’s industry, an industry that is already delivering results today,” he said. EWEA President Andrew Garrad said that at a time when we are all concerned about security of energy supply, in wind power we have a good answer: “European wind blowing over European land, creating European electricity and European jobs in an industry based in the EU in which the EU is a world leader – that’s why we want an EU target of 30% renewable energy by 2030,” he said. EWEA organises a number of successful high level networking events and political debates on topics relating to energy and climate change. Find out about the organisation’s lively debate on subsidies to the energy sector, and future events. Donate to charity? Buy lemon pie? What would you do with €2? Thomas Becker would buy subscriptions to two more daily newspapers, Lasma Livzeniece would donate to animal shelters in Latvia, and Jason Bickley would treat himself to a slice of lemon meringue pie – what would you do if you knew you had €2 extra a day to spend? Where does this €2 a day – or €730 a year – per European come from? It’s the amount each of us spends on importing fossil fuels into our energy-dependent continent. This money could be better spent! In the context of Global Wind Day – the day for discovering the power of wind on 15 June – EWEA has launched a campaign “my 2 Euros” asking YOU what you’d rather do with the money governments spend on importing dirty fossil fuels. Join our campaign to reduce energy dependence by using Instagram, Facebook or Twitter to tell us what YOU would rather do with €2 a day* – or €730 a year! – using the hashtags #my2euros and #GlobalWindDay. Your answers will appear on the campaign page www.globalwindday.org/my2euros. The person who gives us the most creative response will be offered the chance to be interviewed for this blog. Wind is all around us – wind energy does not have to be imported, it is part of the solution to energy dependency! The US is arguably still the most powerful country in the world, but it has always dragged its feet on climate action. So when the US Environmental Protection Agency announces carbon emissions cuts of 30% in the power sector by 2030 (compared to 2005 levels), the news deserves the term “historic”. It is the first time any other US president has regulated carbon pollution from power plants. President Obama had previously tried to push climate regulation through Congress but it had been rejected, so this time he used his executive powers to bypass Congress altogether. The 30% national target will be divided into individual targets for each state, and the new rules will come into force by 2020 at the latest. It’s been a good week for the climate so far: the day after the US announcement China – which has the highest greenhouse gas emissions in the world – also made an historic announcement, saying that it would cap its total emissions by the end of this decade. The exact figure has not yet been specified. It remains to be seen what impact these decisions will have on the UN climate negotiations which kick off this week in Bonn: EWEA will be attending the negotiations and following them closely.